“My Name Is America” Stays number 3, can still move up, Merry Christmas! We hope you are having a wonderful holiday season! It’s not about gifts, but love. Our song, “My Name is America” has held at number 3 for the second week! The top three spots of the Indie World Country Chart actually stayed the same, so we still have a great chance to move up! Charting will not take place this week because of Christmas. We have also broken onto some of the “major” charts, meaning the song is competing with “major label artists.” How exciting is that?! We are getting more and more bigger, commercial stations playing the song. We do still have some other exciting things that could happen with the song also! Keep us in your prayers. We had two SOLD OUT performances at The Breakers Dinner/Showroom for Christmas! Thank you fans! We have one more Christmas show there this Friday Dec 23 and it is already close to full. You can still make reservations at 850-234-6060. We are part of The Holiday Inn Resort’s Big New Year’s Eve Bash this year! They have incredible pricing for dinner, show, party, breakfast and room packages! Visit their website for more info: www.hipcbeach.com. Below you can also see a couple of pictures from a video promo shoot we did for this. Our January Schedule is exciting, including Thomaston, Georgia Jan 5, Hawkinsville, Georgia Jan 7, Breakers Jan 13, 14, The Villages, FL Jan 24, and Apalachicola, FL Jan 27, 28, 29! See www.toddallenherendeen.com for complete info. We will perform at Breakers Every Thursday, Friday , Saturday in February. February is a big month at Gulf World Maine Park too, as they hold their Winter Concert Series. We have a Big Show with Ray Walker, Bass singer for The Jordanaires on Tues Feb 21! You won’t want to miss that incredible performance with tons of music history. Click Here for more info on Gulf World’s Winter Concert Series. We want to take a moment to thank All three of these incredible venues, Gulf World Marine Park, Holiday Inn Resort and The Breakers, for hiring our show. We cannot express what it means to us for them to think enough of us to make us a part of their fabulous venues. It is such a blessing to have the work. 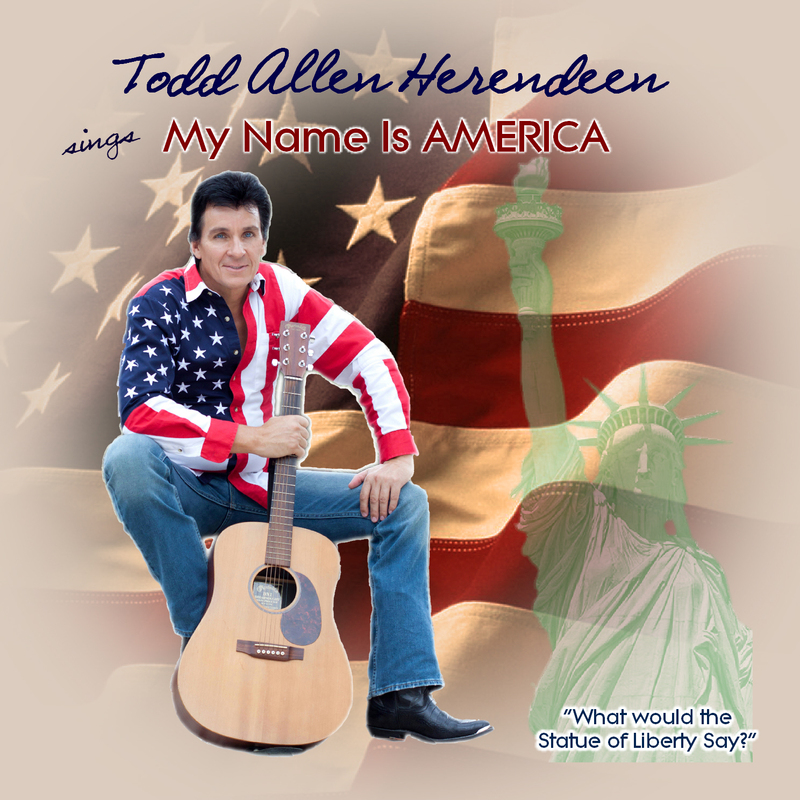 Don’t forget you can order “My Name is America” CD’s for gifts from www.mynameisamerica.us. Downloads from ITunes and Amazon.com are also available from there. My band and I are all thankful to God for the greatest gift ever, Jesus. We are all Christians and are not ashamed of the good that that teaches or brings. No matter what you believe in or celebrate, we love you and are thankful for you too. We wish all of you happiness and blessings for the new year! We hope you know how much we REALLY Love all of you fans/friends. 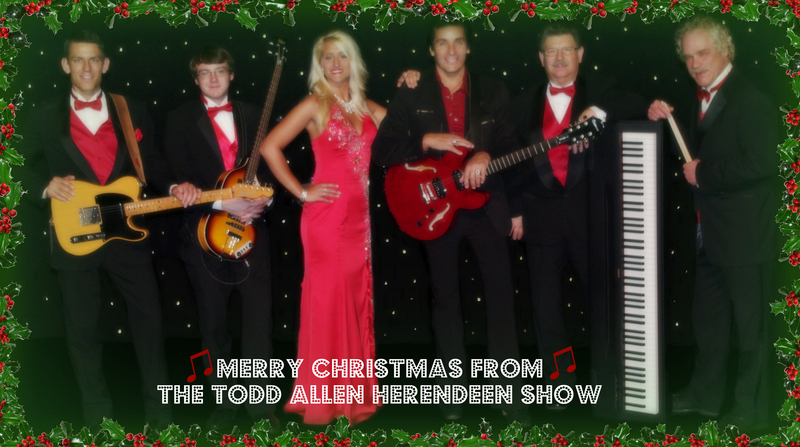 Merry Christmas from Todd and The FTD Band, L to R: Derek, Anthony, Angel, Todd, Bernie, Vic. Two Days and Two Shows in New York! Song moves up to 13!!! Hello out there friends and fans! We continue our journey as I write! If you missed our first blog post about he first part of the journey, got too www.toddallenherendeen.wordpress.com and you can scroll down through all of our past posts! So far we have been from Panama City Beach, FL to Daytona Beach, FL to New Smyrna Beach, FL to Sharon Springs, NY and then to New York City! Whew! It’s been very busy but VERY fun! It is hard work being on the road for sure, but we love getting to see so much of the beautiful country. Tuesday night we performed in Sharon Springs, NY. That is our drummer, Vic Bianchine’s hometown. He got the show set up at the high school he graduated from’s auditorium. All of the ticket proceeds went to Sharon Springs Central School’s Music Department. We want to thank him again for all his hard work getting sponsors and selling tickets! And a big thank you to the Bianchine Family for all their hard work and wonderful hospitality! We hope to come back again for another fun show! We headed out Wednesday morning for New York City! Todd Allen Herendeen and the FTD Band take on The Big Apple! Haha! We actually drove to Parsippany, New Jeresey, which is about 30 miles outside of New York City and got hotel rooms and rented two vans so we could leave the bus outside of the city! We were told by many that driving the bus into the city and trying to find parking would be almost impossible. They were NOT exaggerating! Even in just two vans the traffic was horrific and drivers there are insane, lol! There are no rules or laws when these people in NYC drive. there really aren’t any lanes either, ha! You just honk a lot and try not to hit the people on bikes and the people walking. They run red lights a lot too. It’s a real experience that we wouldn’t recommend for the faint of heart! If you go into the city, take a cab (but close your eyes) or walk. Driving is NOT easy. 🙂 But it was fun and keeps you on your toes. We did get into the city early enough to go to the 86th floor of the Empire State building to the Observation Deck! What a view! You can see some of our pictures below. It was beautiful. We then had to get to The Plaza Hotel for set up and sound check for the show. That had us driving in rush hour traffic, so another adventure! We were just glad we didn’t drive the bus in. There are literally no parking lots and certainly nothing big enough for that! The Plaza Hotel was magnificent! Our show was in the Grand Ballroom. As you can see in the pictures below, it was amazing. What was really amazing was how fast the staff got the room turned from one event to the next! Unbelievable how many workers and how quickly it got beautiful! Big thank you to Danny and Bentley/Meeker Company for their great job with sound and lights. It was a pleasure working with them. Also Thank you to Laura Wang and CPS Events, who puts the events together at The Plaza. Laura was a big help to us also. Jill and ASF, thank you so much for hiring us for your Atlantic Salmon Federation Fundraising Dinner! It was an absolute pleasure to be a part of such a classy event. We got to have dinner at The Plaza before the show (filet mignon) and hang out around the beautiful hotel. The show was short but sweet and we had a lot of nice compliments from the guests. After the show we had met a nice young fellow, Matthew, who offered to take us on a walking tour of the city. What a neat experience that was! We walked down 5th ave, past all the shops like Tiffany’s, Macy, Saks and more. We walked into Times Square, we saw Carnegie Hall, Radio City Music Hall, St. Patrick’s cathedral and even saw people ice skating in Rockafeller Center. Rockafeller Center is where they put up the Grand Christmas Tree, but unfortunately it wasn’t up yet. But you could see some of the huge snow flakes were already hung and some trees had lights and Saks had their windows covered, already working on their window displays for Christmas! What an amazing city it is and how much more so at Christmas time! We didn’t head back to our hotel in New Jersey until about 1 am. We had a great time walking and taking in the sights. Thursday morning we left Parsippany, NJ and hit the road for Alapaha, GA. The traffic ALL day Long was horrendous. We had to go around Washington DC and other big cities and it just never let up. We were in traffic 5 hours I think! Luckily we didn’t have a show on Thursday. As i write this on Friday morning we are in Georgia almost to Alapaha for the show tonight. Tomorrow night we will be in Dublin, GA. We will have one more blog post to wrap up our 10 day Tour in a few days. We Just got the News that “My Name is America” has moved up 4 spots to number 13 on the Indie Carts!! We want to say a HUGE Thank You to our Military Past and Present for all they do! God Bless you and everyday should be Veterans Day! “My Name is America” our song, is ALWAYS dedicated to you! Todd Allen Herendeen and the FTD Band have Played NEW YORK CITY!! Woohoo! Today I went to visit a 3rd grade class in Panama City. One of the little boys in it came to our show last week and told me his teacher had played our song for the class during their “America week”. He said he then wanted to come see the guy who sang that cool song! How cool is that?! To be a GOOD influence on kids makes it all so awesome! So I went to his classroom and talked a little about how important it is to get an education no matter what you do, sports, singing, just anything. It was really neat, I bet I enjoyed as much as the kids did!